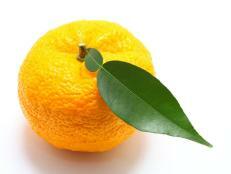 Hailing from Japan, this sour citrus fruit is about the size of a tangerine. The yuzu, which is a cross between a Japanese citrus known as ichang papeda and a sour mandarin orange, has a bumpy green skin that turns Meyer-lemon yellow when fully ripe. The flesh is yellow, heavily seeded and doesn't yield much juice. Also called a Japanese citron, the yuzu is explosively fragrant and has a briskly tart flavor reminiscent of limes and oranges. USDA restrictions prevent the import of fresh yuzus from Japan, and domestic production is in its infancy. If you happen to find them fresh at a farmers' market, choose fruit that's heavy for its size. Green fruit may be kept at room temperature until the rind turns yellow; fully ripe fruit should be refrigerated for up to 3 weeks. The form of yuzu most readily available in the United States is bottled juice, on the shelf or in the freezer section of Japanese markets. There you also might find yuzu kosho, a paste that comprises yuzu rind, chiles and salt. Yuzu juice is used in various ways including in cocktails, ceviche, sashimi, vinaigrette and to flavor Asian soups.